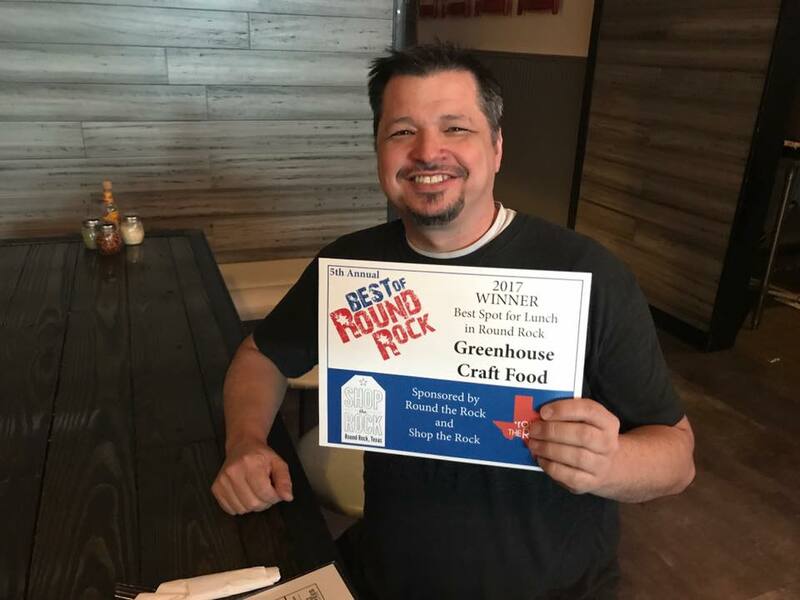 Greenhouse Craft Foods won Best of Round Rock for the ‘Best Spot for Lunch‘ on March 5, 2018. Presented by Round The Rock, this prestigious award The Best of Round Rock awards recognizes businesses, restaurants, services and more that have been voted on by Round Rock citizens as being the “best” in the city. Greenhouse Craft Food is a casual counter-service eatery serving comfort food made with local, seasonal ingredients from Texas farmers and ranchers brimming with bold Texas flavors in a relaxing family-friendly environment. According to Round The Rock, nominees are selected based on annual anonymous vote put together by Round the Rock TX and the City of Round Rock. Greenhouse Craft Foods is open daily and serves breakfast, lunch, dinner and weekend brunch. Their regular menu consists of craft sandwiches, hormone and antibiotic-free burgers, steaks and chicken, pasta dishes, hearty soups and salads and rotating weekly chef specials alongside Texas craft beers and wines. RoundTheRockTX.com reports on entertainment, dining and local businesses in Round Rock, Texas.